Inspired By All the Little Things is starting the new year with a beautiful challenge inspiration photo. Isn't this just the most elegant setting? It uses Pink and Mauve with Metallic Gold so you know that I love this look. Roses are always a classic look although I didn't use them today. You all might get sick of seeing me use this set! I love the color of the drapes on the chairs so that was my starting point for today's card. I also love the sheer elegance of the entire image. I've been playing for the last few days with a gorgeous new stamp and die from Papertrey Ink called Fresh Bouquet with the Fresh Bouquet Die. I am so enamored with this set. As a girl who loves to heat emboss, this set is right up my ally. The entire outline can be stamped with Versamark and heat embossed all at once (no masking required) and then you can stamp the individual layers in the various colors. You could also stamp the outline in the color of your choosing (such as Black), it's just that I really love gold heat embossing! That is what I did here using Simon Says Stamp Antique Gold Embossing Powder on Stamper's Select White Cardstock. Next I stamped the floral layers with Papertrey Ink Lavender Moon, Altenew Puffy Heart and Purple Wine Inks. I used Altenew's Forest Glades for the greenery. I'm still trying to familiarize myself with the Altenew Inks and the colors vs. the names. I have the stuff to make a swatch book, I just haven't done it yet. I'm thinking that might need to happen sooner rather than later. I cut the card base from Lavender Moon Cardstock using the Noted: Scalloped A2 Vertical Dies. While the name would make you think this is a shade of lavender, it actually works better with most blue based pinks like Lovely Lady, Hibiscus Burst, Raspberry Fizz, etc. Autumn Rose looks particularly nice! I haven't mentioned it for a while but Papertrey Cardstocks are heavyweight, 110# super smooth cardstock. The quality simply can't be beat and the price is also fantastic. Colored cardstock is $5.00 for 24 sheets. Stamper's Select White Cardstock is $6.00 for 40 sheets. I wanted to make several of these cards to send to some of my girlfriends. I don't live near any of my long time girlfriends and it is often hard to stay connected with so many miles and activities between us. Everyone is busy with their own families and we just kind of drift away from each other. Sending cards is a great way to stay connected to them and remind them that I'm only a phone call away. On this particular card (although I made several) I used foam tape on the white background panel and the floral bouquet. I adhered the sentiment and the little hearts directly to the background panel using Ranger Multi Medium Matte. If you get a chance, be sure to stop by the Inspired By All the Little Things Blog to check out all of the Design Team's Projects. Thank you so much for stopping by my blog today. If you'd like to leave a comment, I really enjoy reading them. Have a great weekend, everyone! Beautiful card! Love the gold foil die cut sentiment! Gorgeous card, Vicki! I love your wonderful take on the inspiration photo! Wow, this card is gorgeous! Love the colors , flowers and gold die cut! Thanks for joining us at Inspired by all the little things! Absolutely stunning Vicki! Such an awesome interpretation, I love all the details. 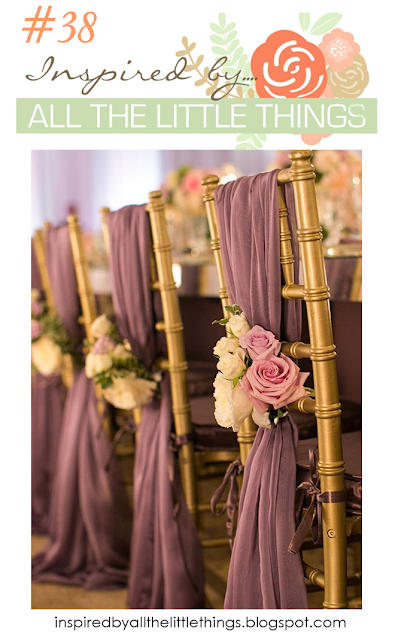 The inspiration picture totally reminds me of my wedding, those were all my colors and I even had those same chairs. I don't always get a chance to comment but I so enjoy your work, your style of cards is my favorite. Thanks for sharing and always inspiring. Very Pretty, especially the gold die cut. Vicki this is stunning! Your colors are gorgeous and the touch of gold is perfection! Very gorgeous card, Vicki! Love the scallop card base! Gorgeous! I love the gold embossing and gold sentiment. It's elegance perfectly suits the inspiration photo. Thanks for playing with us at Inspired By this week.